Afte having a close look on his paintings, let me start with this quick question - what he paints? One can answer this with great ease that he is a fine landscapist or he is a painter of the polite interpretations of Landscape. 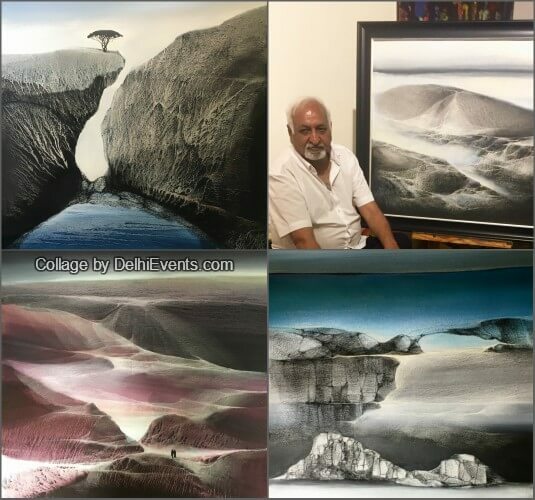 When we have Painters like Ramkumar or Ganesh Haloi - who's work revolves around their earned melodies of landscapes whereas on the other hand painters like Paramjeet Singh or Surya Prakash, who's work reflects various existential and realizable moods of the surrounding nature. Herewith such references, let me return and ratify my existing querry i.e. where Vinod sharma exists ? And his paintings are about rationalist's melody or a realist's memory? This is a tangible truth that his paintings assess our memory, ravishes our senses, exaggerate our attention and forces us to recollect if they really exists on this Planet ? Afterall, in the eyes of a viewer, the realm of his landscape not only produces the path but also ravel the explicit possibilities of our reach in it. Through his paintings, he mystifies the territory by adding the perplexities to its beauty and confines our memory; he not only dislocate us from the edge of our own confirmations but also relocates us in its accumulated shifting paradigms. It may crush our confidence and destroy our sense of experiences as this land actually does not exist anywhere. It is interesting to be lost in his labyrinths of no man's land - with the connotations of a land of no man, and a man of no land. The terrain which is not at all surrounded by any kind of man made encroachments. Is it a site which is either waiting for the civilisation yet to emerge on its sphere or it is a purview where only the aftermath silence exists as an epilogue of its lost civilisation ?